i know, i know. 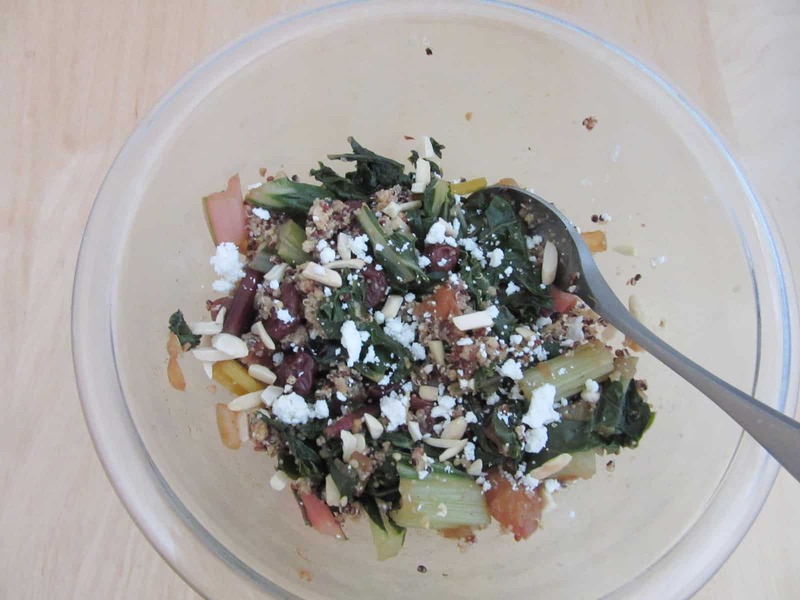 it kind of looks like a grain salad, and how can someone possibly eat salad when it’s rapidly cooling down outside? (notice that i said cooling down and not cold; everyone outside southern california would bite me otherwise). this is more of a pilaf rather than a grain salad, and it’s warm temperature wise as well as from the spices. plus, doesn’t the sound of quinoa pilaf with swiss chard and dried apricots just make you feel all cozy? (okay, maybe not). and if you’re like, WHERE’S THE CUTE HALLOWEEN STUFF, well then, you aren’t familiar with the fact that people actually need more than sugar to survive (i tried that, i really did), or that cutesy and i don’t go hand in hand, or the fact that it’s midterms season in college land and someone is trying not to die in computational linear algebra. anyways, i had made quinoa in a rice cooker (so easy!! cook it how you’d cook normal rice with the same proportions) and mixed it with butter and cinnamon beforehand for breakfast, so i used those leftovers. i already had toasted almonds, so i stirred the cumin directly into the quinoa, along with some apricot/montmorency tart cherry compote i had lying around. which sounds like i always have it in the fridge, but no, i simmered the fruit with water and a spoon of brown sugar for that breakfast quinoa i was talking about earlier. the only thing i really had to make was the garlicky oniony chard, and that was fine- chop and dump. it’s basically how we cook all vegetables at home, only usually without the onion and sometimes with ginger if the cook has enough motivation/cares enough (i like ginger so i’ll add it, but my mom doesn’t so she usually won’t). mix it all together and you…. i’ll stop. i topped it with some crumbled feta, because i love feta. you can but you don’t have to. it was super easy for me to put this quinoa pilaf with swiss chard and apricots together, because i was able to use a mishmash of ingredients i already had prepped. you could sub in your leftovers (rice or couscous or another grain for the quinoa, or the cabbage or kale from last night’s dinner), too. even if you don’t, it’s not a huge deal, and this recipe is still doable on a weekday night. it’s a little rich from the butter, and in a different way, the feta (it’s salty, but i also think of it as creamy). the cinnamon and cumin add a certain je ne sais quoi (it’s so sad that my 3 years of french have dwindled to this and je ne sais pas and j’oublie). okay, you know the cinnamon, but then you add in the cumin and it gets foreign. at least to me. there’s a less apparent sweetness from the onion shying underneath the candied sweetness of the fruit. and the chard’s greenness comes through and mellows out the fruit. and can i recommend that if this is your first time hearing about melissa clark, you should look her up further? because this quinoa pilaf with swiss chard and dried apricots is really tasty, and her polenta with chard (i used the leftover chard from this recipe, in fact) and olive oil fried eggs is also superb. she’s on a roll. Mix the grains, cinnamon and apricots. In a large skillet over medium-high heat, melt the butter. Add the pistachios, cumin and some salt. Cook, stirring until golden, about 2 minutes. Transfer to a bowl. Return skillet to medium heat and add 1 T oil, garlic and onion. Cook, stirring, until the garlic is fragrant, about 30 seconds. Add the chard and 1/4 tsp each salt and pepper. Cook, tossing, until the chard is wilted, about 3 minutes. Stir in the bulgur and nuts. Toss until warmed through. Transfer to plates. Top with feta and lemon juice.